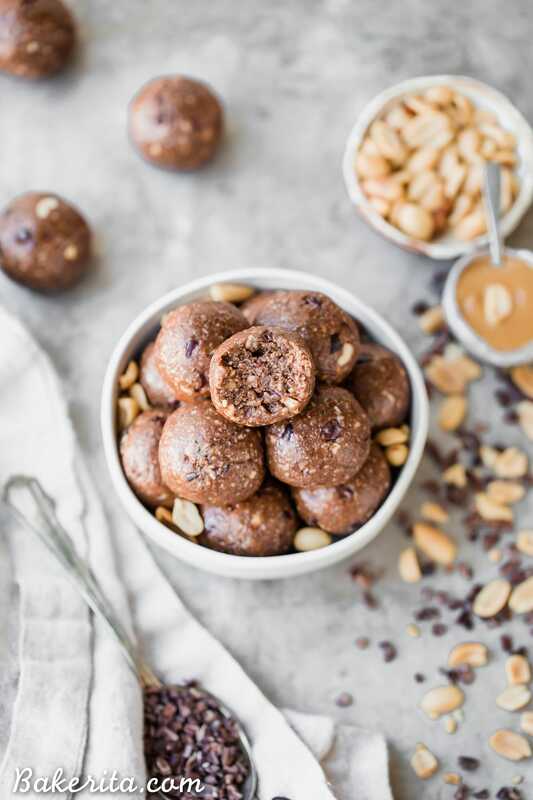 These Cacao Peanut Butter Fat Bombs taste like an indulgent treat, but they’re actually super filling and fueling! 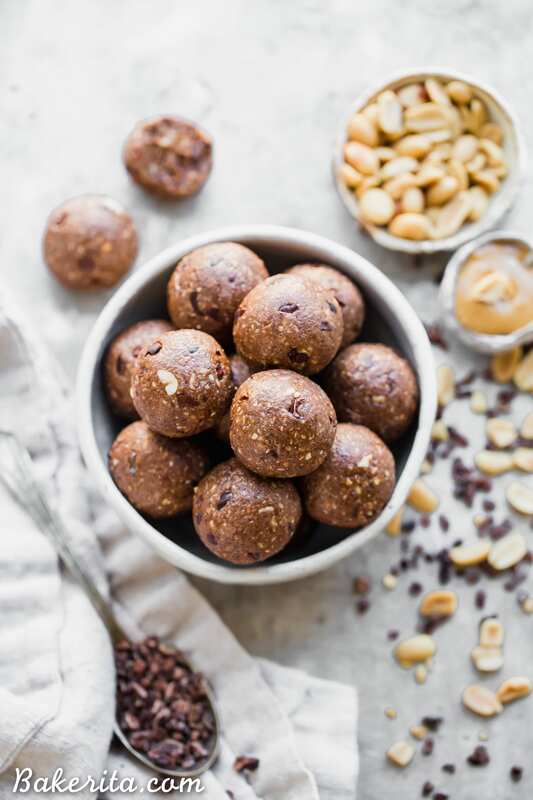 Made with peanuts, peanut butter, and cacao nibs, these fat bombs are a gluten-free, keto, vegan, and low-sugar treat that makes the perfect snack. 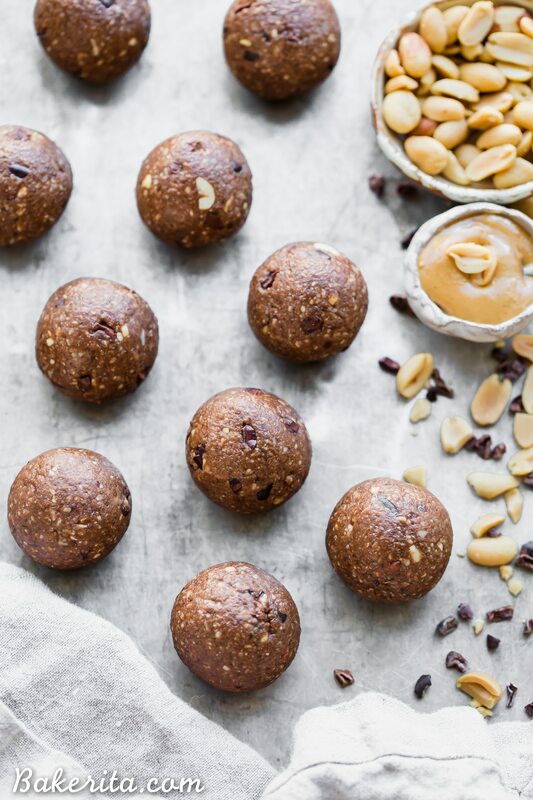 Since these Nutty Coconut Fat Bombs came onto the scene (of my kitchen), I’ve kept a fat bomb of some sort on deck at all times, because they’re the perfect thing for me to devour before taking Hank on his morning walk, or when I’m hungry but rushing to yoga class. Soon after these Pecan Pie Fat Bombs were devoured, I whipped up a new version, full of peanut butter and cacao powder and seeds and cacao nibs. I had just posted a fat bomb recipe though…so I kept them to myself. And then every day as I would grab one to devour, and ate it so happily, I would realize that I realllllyyy needed to share this version for the chocolate peanut butter lovers out there, like me. It’s chocolate and peanut butter in a hearty, filling, and FUELING form. It was just kind of mean to keep this one to myself, so this one is for YOU, my fellow chocolate and peanut butter aficionados! Now…let’s make Cacao Peanut Butter Fat Bombs! I made these in my handy dandy Vitamix, but you can also use a food processor if you have one. It would probably actually be easier in a food processor. But, I don’t have one, so I stuck to the Vitamix. Now, the process for these fat bombs couldn’t be much easier. You just combine all of the ingredients (except the cacao nibs) in your food processor or blender. Then, just let it blend until everything clumps together into a delicious dough, which you’ll then roll into balls, and voila – you’re done! The ingredients used are simple, too. We use roasted peanuts and shredded coconut, along with coconut butter and peanut butter to help hold everything together. Cacao powder adds that chocolatey flavor, and hemp seeds and flax meal add extra nutrients and fiber. I added a soft and sweet Medjool date too, to help sweeten things up a bit. If you’re keto, you can definitely skip the date to keep these super low sugar. You might want to add an extra tablespoon of nut butter if things seem dry, though. A dash of salt and some crunchy cacao nibs round out the lineup. All-star team, don’t you think?! The resulting Cacao Peanut Butter Fat Bombs are hearty, filling, fueling, and most importantly: super delicious! These are a treat you’ll be excited to grab as you rush out of the house, or to hold you over until dinner ;) I hope you enjoy them as much as I am! 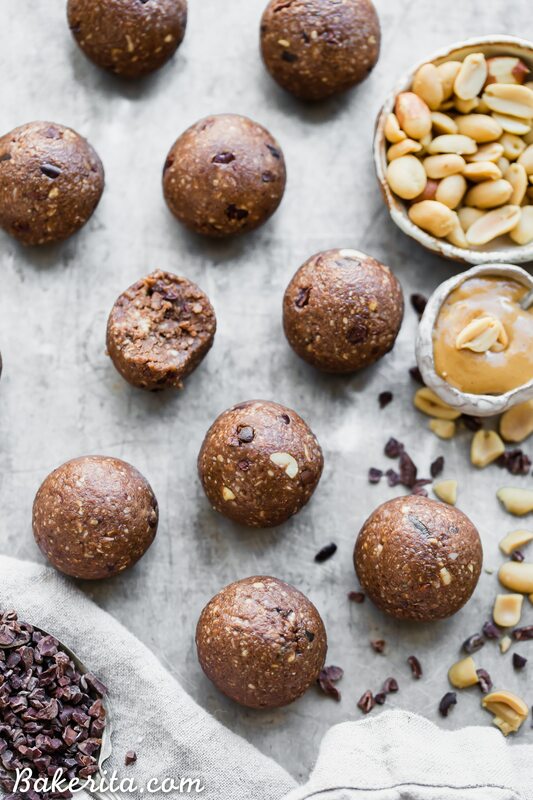 These Cacao Peanut Butter Fat Bombs taste like an indulgent treat, but they're actually super filling and fueling! 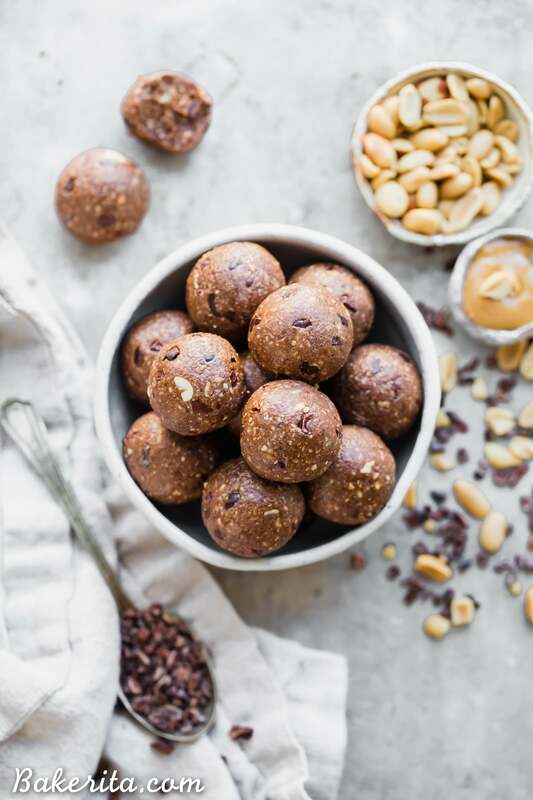 Made with peanuts, peanut butter, and cacao nibs, these fat bombs are a gluten-free, keto, vegan, and low-sugar treat that makes the perfect snack. In the bowl of a food processor or high-powered blender, combine all of the ingredients. Pulse for 1-2 minutes, until the peanuts start to break down and everything starts to break down. It will first become powdery and will stick together slightly, but still be crumbly. Keep processing until the oils start to release a bit and the mixture sticks together easily - just be careful not to over process or you’ll have nut butter. If your mixture seems dry and if you're not using the date, you may need the extra tablespoon of peanut butter to help it come together. Once the mixture is sticking together well, pulse in the cacao nibs, just to incorporate them. I admit I still don’t fully understand the “fat bomb” recipe I”m seeing on Pinterest daily… but I can get behind this snack! Yum. I’m working on having the nutritional info updated, but for now you can calculate yourself at myfitnesspal.com! This definitely looks indulging! I love everything in this recipe from easy-made to the mix of ingredients and especially the use of cacao which adds a more chocolatey flavor. Perfect for any day snacking! They certainly are! Thanks for the love, Nancy.